We are on the precipice of another gardening year. Are you ready? Sometimes the thought of it energizes me and sometimes it exhausts me. It all depends on the particular minute I happen to think about it. I thought as a way to launch you into the gardening season, I would share with you some of the things we've learned in our 6 or so years of gardening and preserving. Mind you, we're still mighty young as gardeners go. Even so, maybe some of these thoughts will help you this year. Heritage red raspberries leafing out. Remember to prune these about knee high in the early spring and remove dead canes. They like a little mulch, but not too much as they need good drainage. First off, we've learned that mulching our garden is worth it. It makes for a garden that looks a bit different than most traditional gardens you might see (as the photos in this post illustrate) but the benefits outweigh the odd appearance. 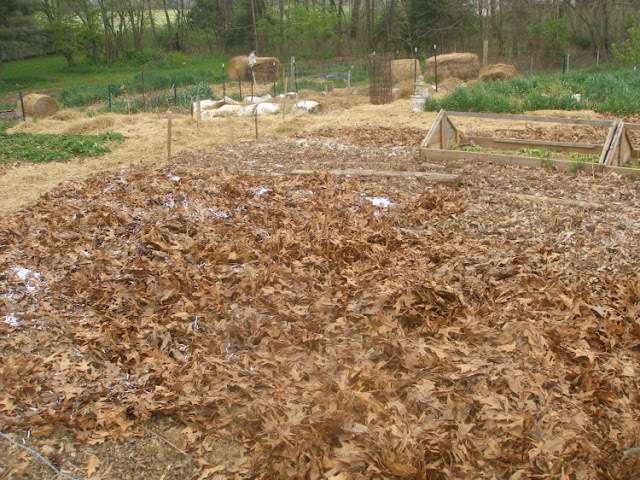 Mulching with hay, dried leaves and even shredded paper keeps moisture in, keeps weeds down, gives you clean pathways to walk on (and kneel in) and makes for pulling out the occasional weeds easier because the ground underneath is moist and not bone dry. The decomposing leaves and hay breakdown adding to the organic matter. Earthworms thrive and multiply under the decomposing leaves, breaking down clay-y soil, adding nutrients and aerating the soil. Some folks express concern that the straw itself may sprout weeds. The secret to the straw is to lay it on really thick. This squelches any little seeds that may try to sprout. Some people lay newspaper down before the straw to help with this, but we just lay it on super thick (8 inches thick of loose straw). 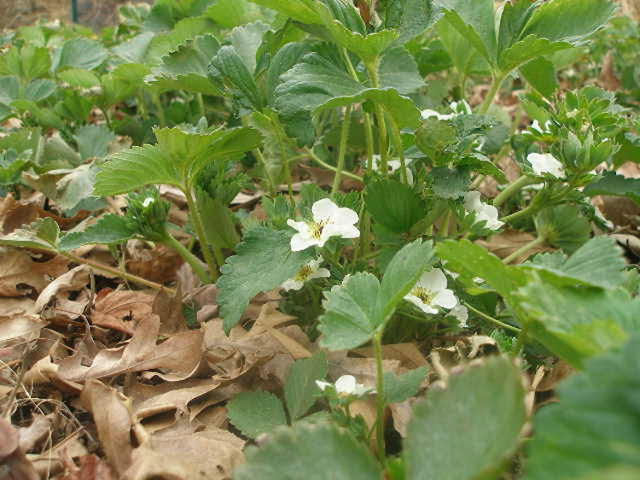 We do consider how terrible it would be for weeds to become established in crops like strawberries which remain in the same spot for several years and therefore would be difficult to to a purging of all things growing, so we mulch strawberries with leaves. That said, by mulching heavily, this hasn't become a problem. Grass sneaking in from the yard around the perimeter is a much greater threat for us. Now, while all this sounds good, you still have to weed. 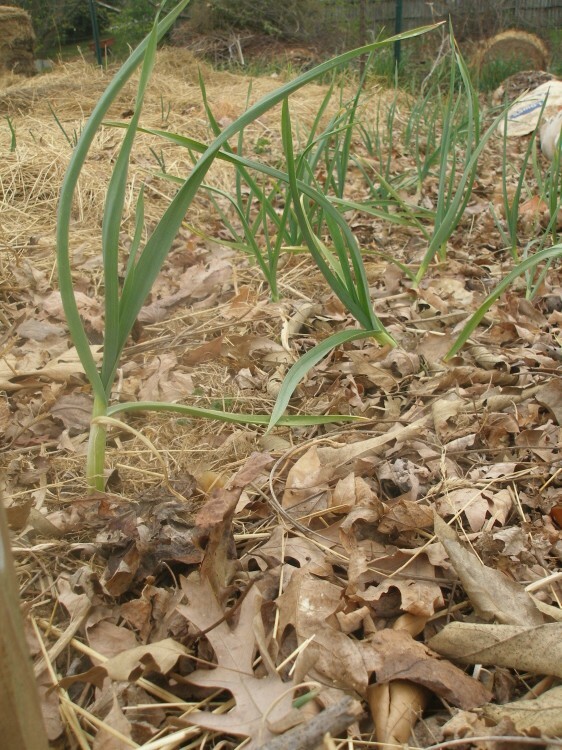 You still have to pull the mulch aside to plant, then place it back around your plants when they're established. When it's super dry, you will still need to water. It doesn't mean you can completely ignore the garden, but it does free you up a bit (and keeps your shoes from becoming muddy messes after it rains). Secondly, try anything, but start out small. Thinking about planting something you've never planted before and not sure if your family will love it or if you'll be able to find enough ways to preserve it? Go slow. Don't waste garden space on new endeavors that may bomb and overwhelm you come harvest time. Even though unused produce can be composted or given away, those instances can leave a sour taste in your mouth and frustrate you. We've found that it's a more enjoyable experience to try a small patch of something new, find we love it, and look forward to planting and planning for more the next year. We planted sugar peas this year instead of garden (or English peas). The straw was pulled out of the way and left in the paths. 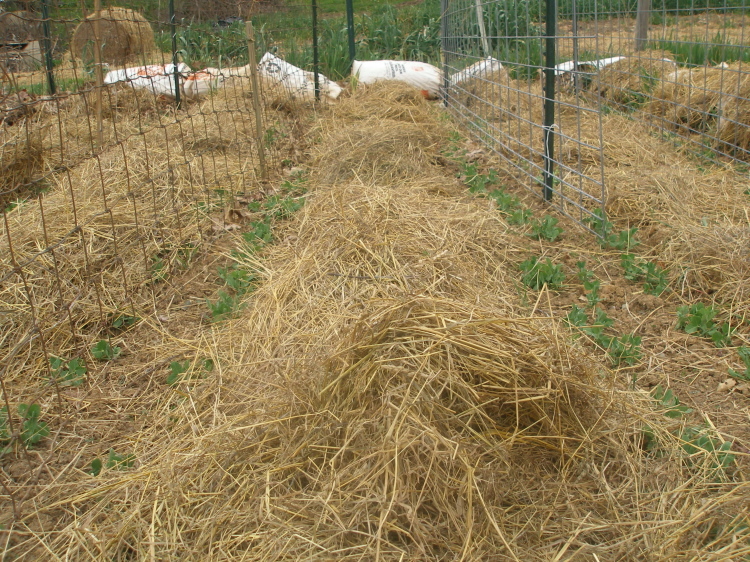 Once they're taller, the straw will be put back under them to hold in moisture and keep down weeds. Thirdly, can (or freeze) new things in moderation. Experimenting with new canning recipes can be fun, but when you go crazy with it, there's a chance your family will either grow sick of it or won't like in the first place. What a waste of time and energy! I've tried numerous recipes that we've liked at the start, but grew sick of because I canned ridiculous amounts. Instead, try new recipes in small batches and save your mammoth canning projects for those foods you know your family loves and will eat. For us, it's applesauce, tomato sauce, tomato soup, canned fruit, stewed tomatoes and jams. I can other things, but I save most of my jars for these projects. Lastly, be kind to yourself. Don't set expectations you can't live up to. Recognize the life stage you're in. Are your kids at an age that you'll be able to leave them alone long enough for a good weeding session now and then? Can you trust to have them in the garden with you without having to watch them constantly for fear they'll walk over your new plants? Do you have a spouse or older children that will have time to help you? Take all these things into account while you plan and plant. Each year will offer new challenges and added benefits as your family and garden experience grows. Be flexible with yourself. Gardening is great, but it isn't our life. Finding ways to incorporate it into your life instead of trying to fit your life around your garden is something that we've discovered is important to do. Oh, and one more thing. This one is very important. Are you ready? It's okay to have some weeds in your garden. I'll say it again. It's okay to have some weeds in your garden. Don't let them overrun the place, but don't beat yourself up over a few weeds. Even if company is coming. I think we're ready. We are ready...right? Of course we are. Happy gardening, friends! Your soil and its inhabitants love you for all that mulch. :) Hope your garden does very well this season. Do you have trouble with your weed seeds in your straw? We bought straw specifically for mulching and it's sprouting, grr. Sometimes it feels like the straw is a risky endeavor---that it might make more work. Do you feel this way, too? The secret to the straw (and I'll update the post above to reflect this) is to lay it on really thick. This squelches any little seedlings that may try to sprout. Some people lay newspaper down before the straw to help with this, but we just lay it on super thick (8 inches thick of loose straw). We do consider how terrible it would be for weeds to become established in crops like strawberries which remain in the same spot for several years and therefore would be difficult to do a purging of all things growing, so we mulch strawberries with leaves. 1. What is the white box in the first photo? Bee box? 2. No shelling peas? I foresee lots of stir fry meals ahead if you decided to freeze the snap peas. 3. Your strawberry and lettuce looks awesome! 1. It's a bird house:-). 2. No shelling peas and, yes, we plan to eat lots of stir fry meals and freeze the sugar peas. 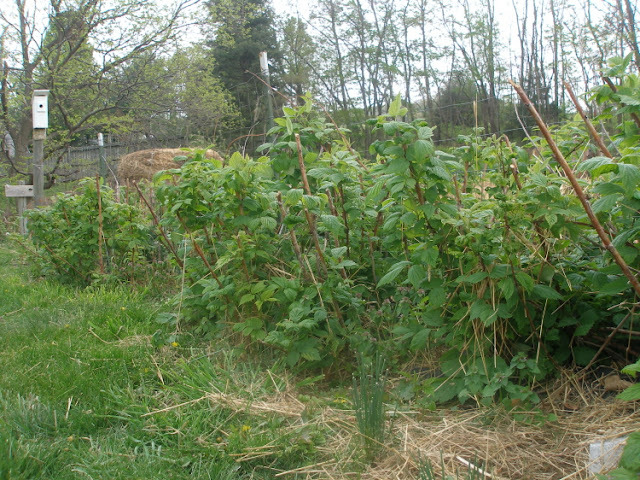 I'm curious how you manage your Heritage raspberries. We have those, too, and have been mowing them down in late fall/winter. They come up again in the spring and bear one crop in the fall. Looks like you keep your canes over the winter? We live in planting zone 7 and our Heritage raspberries produce twice a year for us- once in the early summer and again in late summer. I'm not sure if this has to do with where we live or if it's because we only cut them back to knee-height in the very early spring. We do let the canes stand as they are over the winter. They also like full sun. I can't decide if I'm excited or exhausted when I think about gardening this year, and I only have two little boxes to garden in! I just finished a post about my new garden and found myself becoming anxious over the very things you mentioned here. Thank you for reminding us newbies that like everything...moderation is the key! I am looking forward to learning what has almost been lost for many! Blessings to you! I love your suggestions; they are good reminders. Thanks! That's wonderful, Judy!! Please send him our congratulations- what an accomplishment!! You do all the roof-top-yelling you want:-). Fabulous posting of great, practical advice! I couldn't agree with you more. Where I live (New England), I'm able to buy salt marsh straw, which will not sprout, for mulching. Love it! 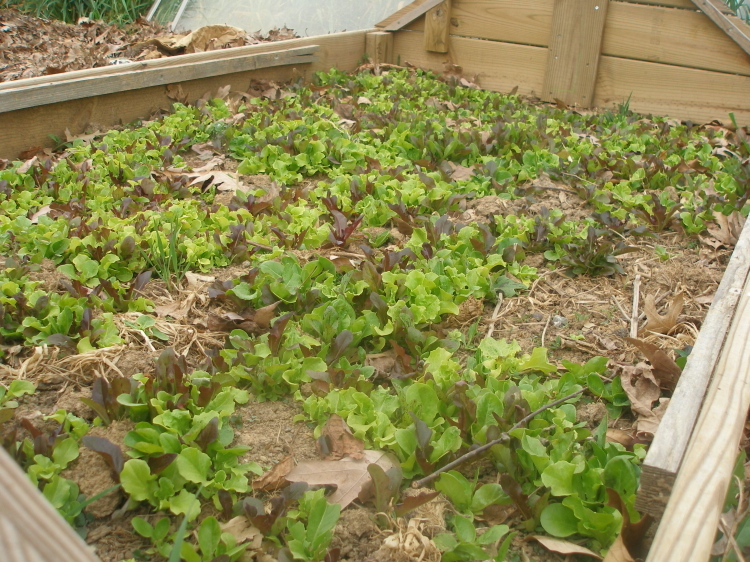 I also think that its prudent to devote garden space to crops that can be preserved, and therefore save money on the grocery bill all year long. As California transplants, we were desperate to find good, HOT salsa in New England. Finally gave up on that idea. So now I plant the crops I need to make my own, and then freeze a year's supply. By the way, your quiche recipe is THE BEST! I make them and freeze them. So delicious!